يشكل فندق فندق أتلانتيس ميلبورن بموقعه الممتاز في منطقة الحياة الليلية, تسوق, الأعمال ضمن المدينة، مكاناً ملائماً لقضاء العطلة بعيداً عن عجقة أيام العمل. يسهل الوصول إلى هذا الفندق ذو 4 نجوم من المطار، فهو يبعد عنه مسافة 18 Km فقط. يضفي محيط الفندق اللطيف وقربه من أكثر المعالم السياحية جذبًا سحرًا خاصًا على هذا الفندق. يعمل فندق أتلانتيس ميلبورن على ضمان إقامة مريحة لضيوفه من خلال خدماته الممتازة وحسن ضيافته. لضمان راحة ضيوفه، يقدم الفندق الخدمات التالية: مكتب استقبال 24 ساعة, مرافق مخصصة لذوي الاحتياجات الخاصة, تخزين الأمتعة, موقف سيارات, خدمة غرف . في الفندق غرف نوم يتجاوز عددها 232، كلها مجهزة بعناية وجمال وبعضها مزود بـ مناشف, تلفزيون بشاشة مسطحة, مرآة, بياضات, سياسة التدخين - غرف لغير المدخنين متاحة. صممت خدمات الاستجمام في الفندق والتي تتضمن مركز للياقة البدنية, مسبح داخلي لمساعدتك على الاسترخاء والراحة. إن فندق أتلانتيس ميلبورن هو خيار ذكي بالنسبة للمسافرين، فهو يوفر إقامة هادئة ومناسبة للاسترخاء. Enjoyed another stay at Atlantis, Melbourne. Pros: location, clean and well appointed rooms, good A/C, friendly Staff, easy and quick check-in and out, close to tram lines (Routes 86 & 96). Cons: ummm? Overall it’s pretty good. Location is perfect. Staffs are friendly and helpful though we didn’t get the right room for 3 times because of some system errors. And I would recommend the hotel to change the bed because it’s too soft and doesn’t have enough support! Pool and accommodation is fabulous and staff nice too. (We asked for a lower ground floor room at the time of booking as we had a lot of luggage for two baby twins and we ended up on the 9th floor). Good size rooms and very clean. Only other comment is the quality of breakfast needs improving. Great to have it on offer but very limited... nice scrambled egg but no bacon, sausages or tomato. Baked beans cold and orange juice undrinkable. Apple juice okay though. 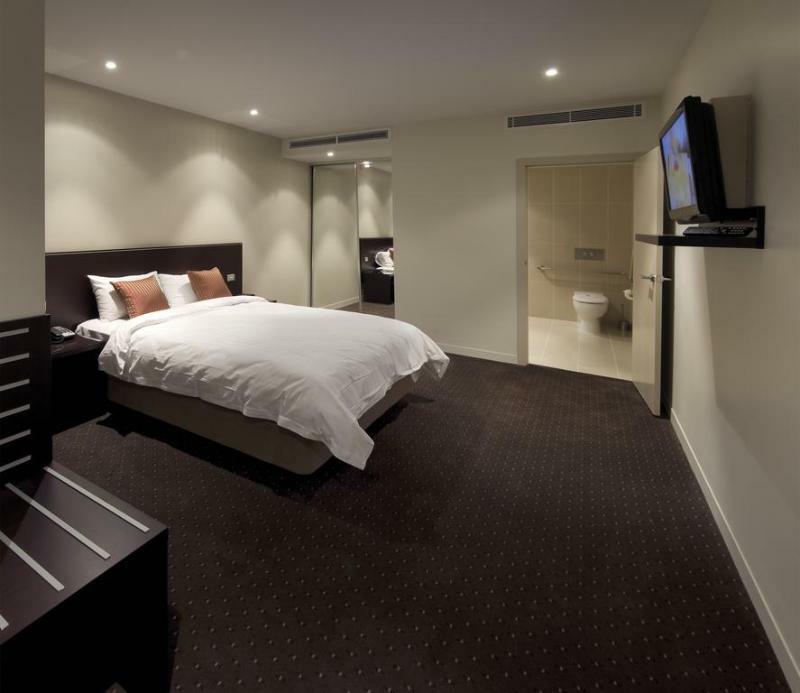 Very clean and tidy hotel. Close to everything I needed, such as Southern Cross Station and tram lines (principally 86 and 96). Friendly, helpful Staff. Check in & out were quick and easy. Would recommend to all travelers. The rooms were very clean and a great size. Staff were kind and helpful. The pool was quite small but the sauna was nice and the gym was decent as well. Wifi in our room was horrendous and that is our major complaint. Otherwise we were very happy with our stay. 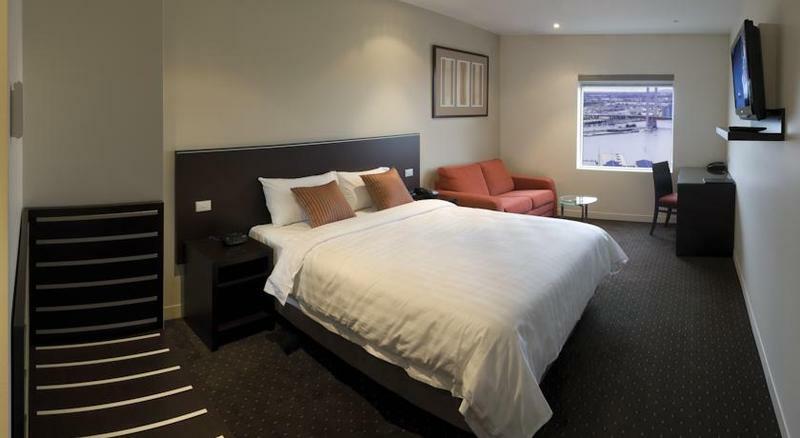 This hotel was quite a nice place to stay while I attended the Avalon airshow. 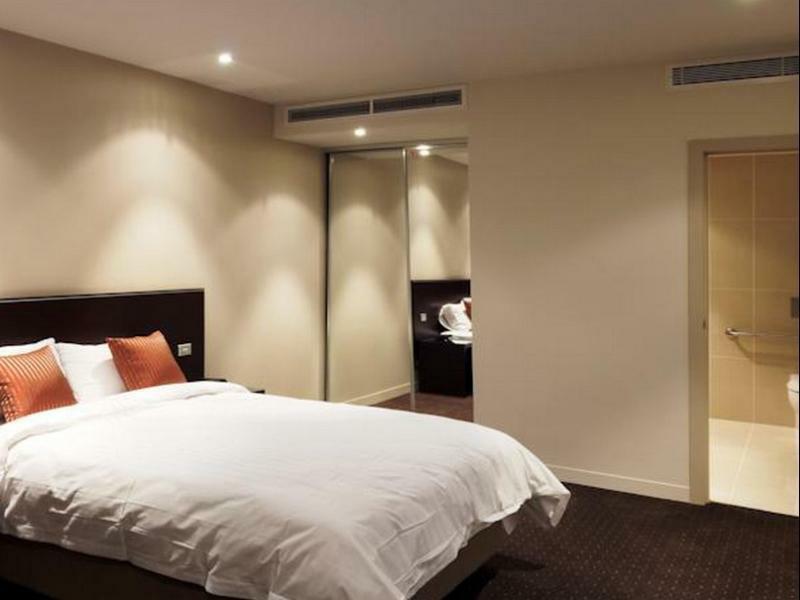 It's convenient location was close to the V/Line train at Southern Cross Station. I shared a twin room with my Dad (room 1822). The single beds were slightly small and I would recommend the hotel invests in King Single beds. Our room was clean and the bathroom was nice. Upon arriving into the room I was disappointed that the only window we had was 50cm wide and frosted. No views and barely any natural lighting. It was quite a shock to the system when I jumped into the pool and realised it wasn't heated - Despite reading previous reviews about how wonderful the heated pool was. Overall it was a nice experience and I look forward to staying again some time . The staff were friendly in giving directions and sharing local Melbourne knowledge. Room was pretty decent sized. Had plenty of space for a solo traveler. Cleaned and reset the room daily except on my last day there, not sure what happened. There wasn't an ice machine in tower one where I was staying so had to ask reception or kitchen staff for ice but they were all extremely friendly and helpful. My room really didn't have a view which was fine by me since I only used the room to sleep and shower. Near the main Southern Cross Station if you're looking to get further out. Good location if you're looking to get to St. Kilda as it's right next to the 96 Tram line which takes you to St. Kilda. It is a little bit more of a walk to the more central CBD where all the stuff is, Swanston and Bourke St. But the CBD is covered by the free tram system so, it doesn't really matter. Anywhere you stay in the CBD is good if you like the tram. If you prefer minimal walking (it's only a 15-20 minute walk to the other side of the CBD) then you want near Flinders Station. We booked this hotel to stay in the city after a Christmas function as it was going to be cheaper than getting a taxi or Uber home. As we drove into the city, the location couldn't have been better. Very easy to get to and parking for only $20/night. The hotel itself is a little tired and in need of a refurbish, but for the price we couldn’t moan. The only downsides was the air-con and wasn’t working in the room, but they sorted that out. Also, the safety deposit box was out of order, but it wasn’t secured to anything and was easy to lift from the cupboard, so we wouldn’t have used it anyway. Overall a great hotel and staff are very efficient. We’ll definitely stay again. Somewhat rundown. Room very plain and in need of up dating. Breakfast buffet identical every morning and little selection. Not a single meat item. Close to free city tram. Rooms are clean to the touch, but things like stains in the grout and tiles, as well as stains around drains could be deep cleaned. Also 90% of marks on the walls wouldn't take the cleaners more than 1minute to spray at the start of their clean then let soak and then wipe away at the end of the cleaning service. The room's windows could do with better blinds in my opinion. I didn't care about zero view, however. The pool area has no spa, either. Just a few minutes walking distance from skybus. Near to supermarket too. Most i like is tram just in front of hotel. Smooth check in and check out. Large room, bathroom and great facilities. The hotel is not a high end hotel so don’t expect too much. But it’s clean (except some smell when you just enter room, but it’s alright if you keep ventilation on) and it’s located conveniently. Staff are helpful and friendly. I am happy to have stayed here. 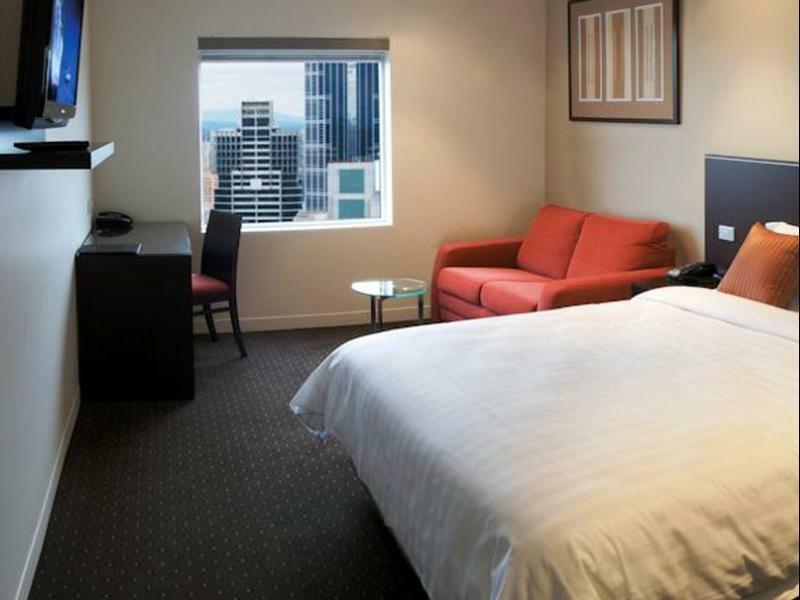 Location is really convenience, near to Southern Cross Station where we can take airport bus, bus, train to many places. Pros: the breakfast is not many dishes to choose, or we have to pay for different menu. 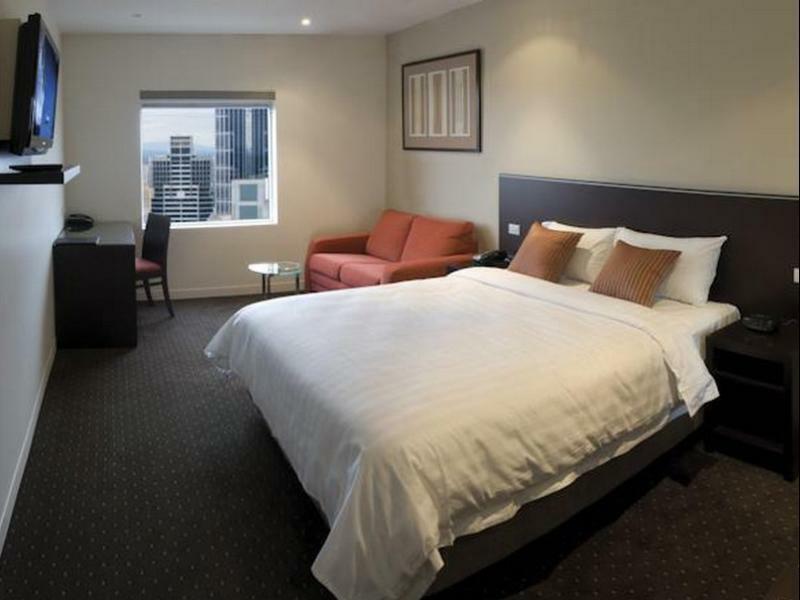 Perfect location just opposite Southern Cross Station and Coles that operates till midnight. Friendly and helpful staff that made check in and out hassle free. Clean and homely room. Good water pressure! Will definitely choose Atlantis again on our next visit. Location is good. It is closed to Southern Cross Station where the bus is to and from the airport, supermarket and convenience store are located. Free trams stations are around the the hotel. If you join local tour, the driver can pick you up at the hotel. But the room is not clean enough and shower is not that good. Price is fair with comfortable bed and lots of space in the room.